But I have to say, I was not off to a good start with the orange-caramel sauce. One minute, the sugar was in the saucepan over medium-high heat, just starting to melt. The next minute, it was a deep brown and I was yanking it off the stove convinced I had burnt it! I quickly scanned the recipe and the words “deep caramel colour” stood out to me. Yay! It was going to be okay! Just keep going! But while I was doing a little victory dance, my melted sugar started to harden, so in a panic I threw it back on the stove and poured the wine and orange juice on top. Dorie was right! This caused a lot of bubbling and spattering. So now I had a mixture of frothy, orange liquid with a hard mangled chunk of caramelised sugar floating in it. And slowly it did! Phew!!! By the time I had it reduced by half, it even smelled good! The scallops cooked perfectly and I picked at them as I went along. Cooked in a bit of oil with some salt and pepper, they were amazing! The sauce was nice, drizzled lightly over the scallops. I had a few bites of scallop doused in the sauce and really did not like it. But a light drizzle added a really nice flavour. Such an elegant result for so little effort! Can’t wait to see what the others at French Fridays with Dorie thought! Tags: cooking, food, french food, french fridays with dorie, recipes, seafood | Permalink. Nice looking scallops. My caramel seized like yours as soon as I added the liquids, but it melted! Kitchen magic. Yay! I had the same experience as you, with the syrup getting hard after the liquid was added. Your photo is beautiful. Glad you enjoyed your scallops! I thought the sauce was great and added so much flavor to this lovely dish! I also had a few harried moments when making this sauce, but it turned out so well. Too bad we can’t have Dorie standing by saying, “Oh, that’s normal. Keep going!” Ha! Your scallops look great! Your dish looks lovely, especially with those sides. Great background! The same thing happened to me with my caramel! I usually cook sugar down a cup at a time, so wasn’t prepared for the quick turnaround! Your mash looks divine! What a great job! I agree – such elegance for very little effort. I will definitely make this again. Yes, that siezing always turns my stomach… even when I know it’s going to happen. Glad to see you survived. And that pumpkin/ potato mash looks awesome. Had the same reaction with the sugar- nice to know from all the other comments that this was typical. Certainly keeps life in the kitchen exciting ! I went from this scare to wondering how the spitting juice and vermouth were going to make it to a decent sauce…but Dorie came through as usual. i also have to say that I came to your site for the scallops…but am IN LOVE with the coffee cake recipe. This looks incredible !! My 14 year old is sitting here looking also because he loves baked items. He made me promise to try it. Thanks for the inspiration and recipe. Pumpkin and potato mash sounds delicious! 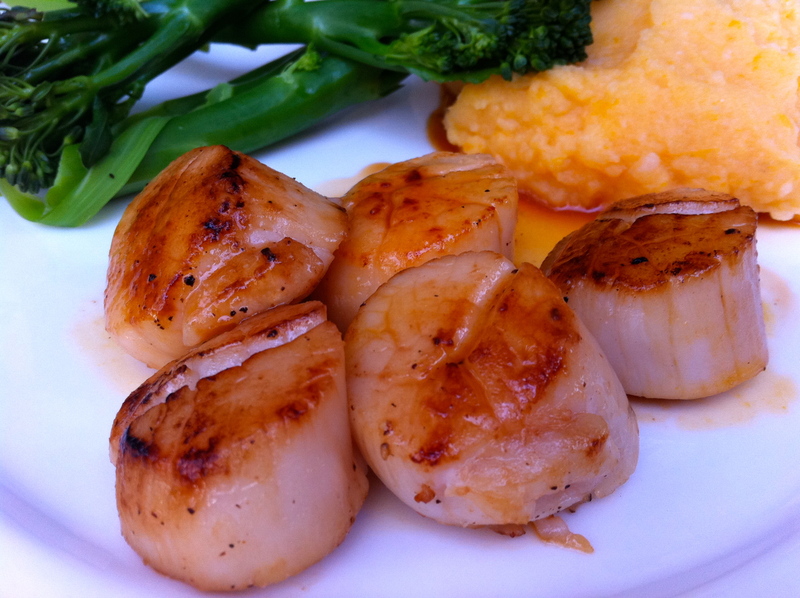 I would have been fine without the sauce on the scallops, though I’d like to try making it again with regular sugar. (I used brown sugar in mine, and I think I burnt it.) And it was an easy dish! That is the most beautiful photo of the scallops! Just makes me want to make another batch! Really nice photo and I like your sides…pretty colors to frame the scallops which look elegant. I’m always looking for new recipes that use my citrus and this one turned out really well…usually my recipes are desserts so this was nice for a change. That’s a lovely photo. I like your choice of accompaniments, too. Caramel is such a touchy thing – I’m glad yours turned out in the end. I had exactly the same freak out experience with the caramel but it worked out beautifully! I loved this one. I also had a manic-depressive episode with the caramel sauce! It was more forgiving than I imagined and everything turned out. Your scallops look beautiful! Pumpkin & potato mash sounds delicious! What a wonderful dish…looks and sounds incredibly delicious! Beautiful photo!